The beautiful resort island of Reethi Faru in the Maldives was rich with nature and exotic wildlife, and there were a few things on the island that we'd never seen before. The marine life was absolutely stunning; there were so many different varieties and amazing colours of fish, it was hard to believe that they were real. 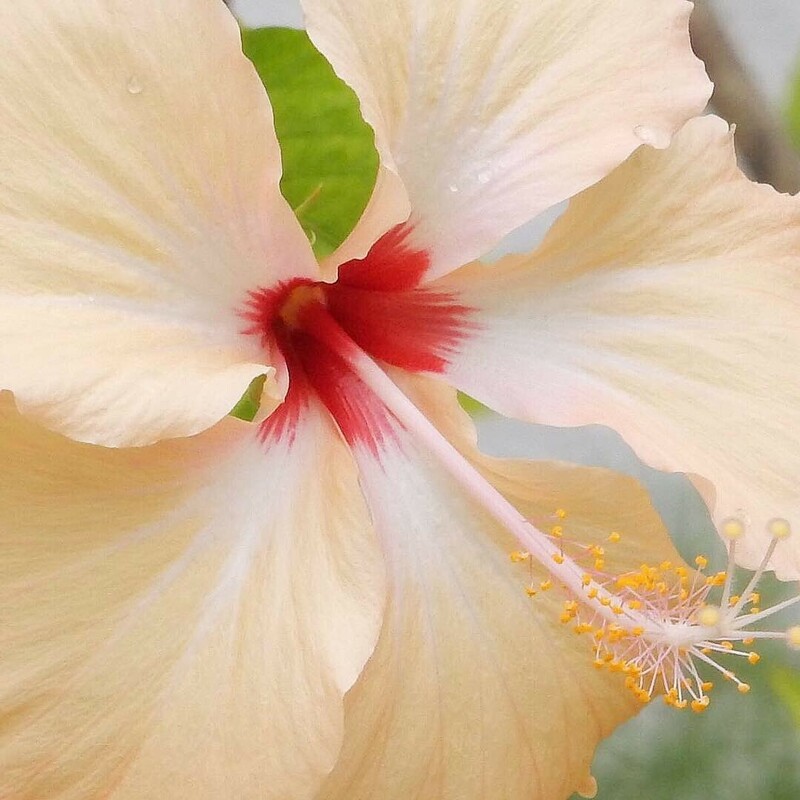 Here is just a snapshot of some of the beautiful things we came across on the island! 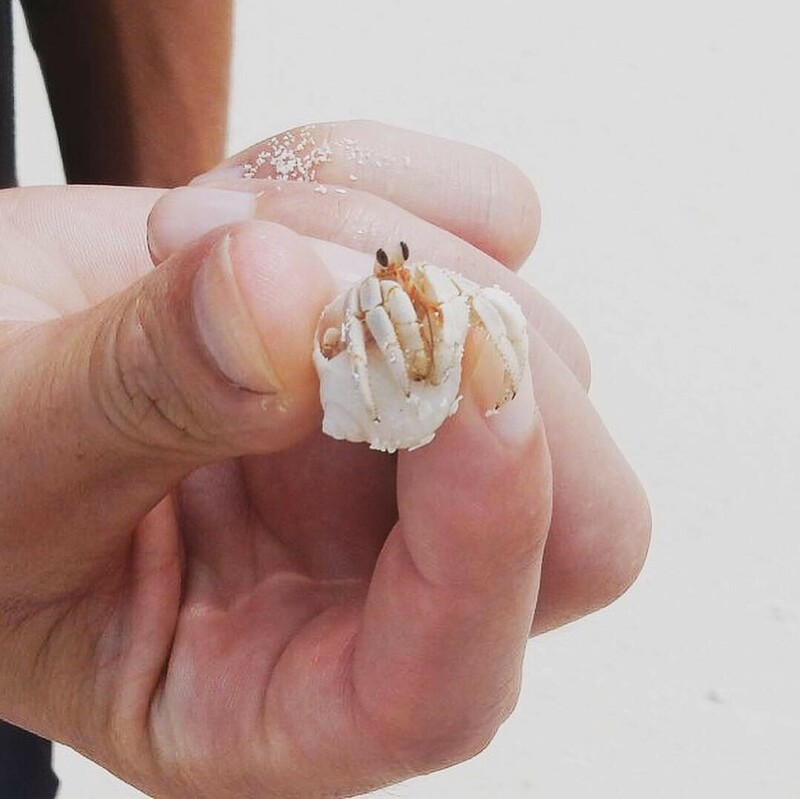 Hermit crabs protect themselves from predators by making themselves at home in an empty seashell, and use this to retract their whole body into. As the hermit crab grows larger in size, it finds a larger shell and abandons the previous one. 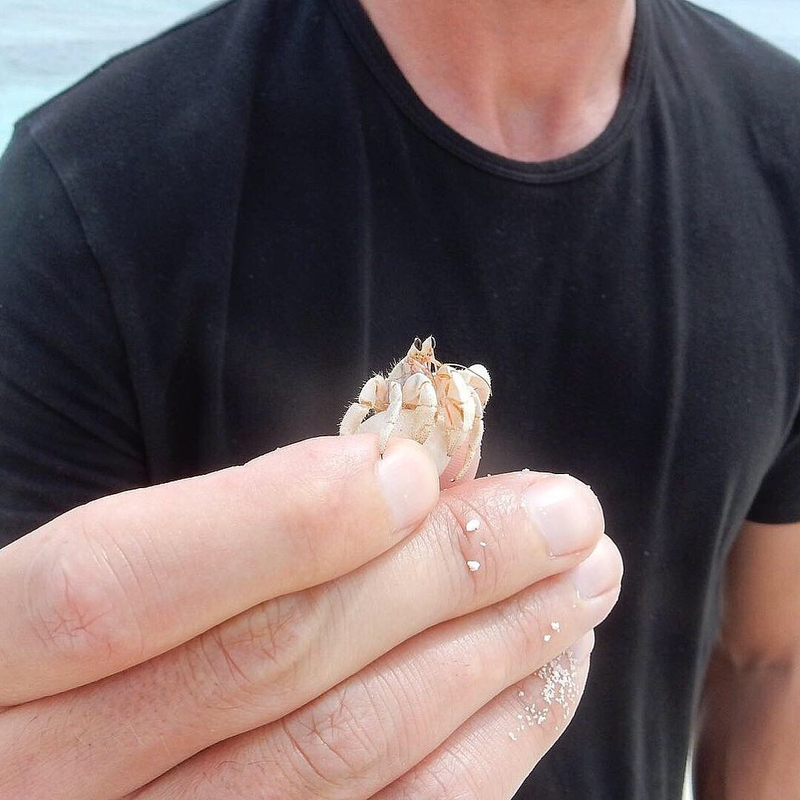 We saw quite a few of these scuttling along the sand, and David kindly picked one up for a photo (I didn't want to get nipped!). 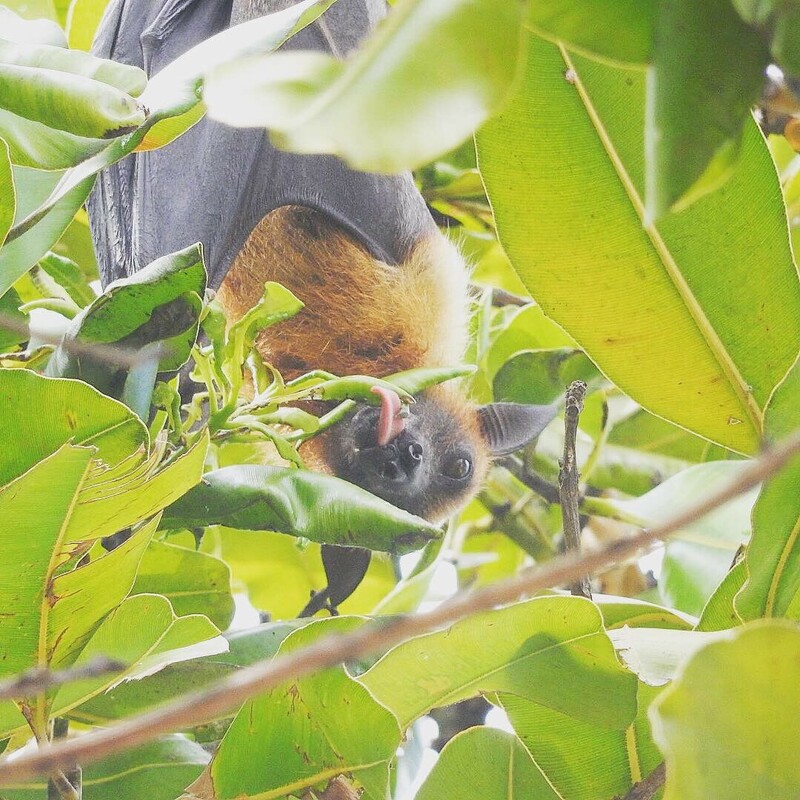 I'd never seen Fruit Bats in their natural habitat before, and it was really cool seeing them hanging in the trees and snacking on fruit. 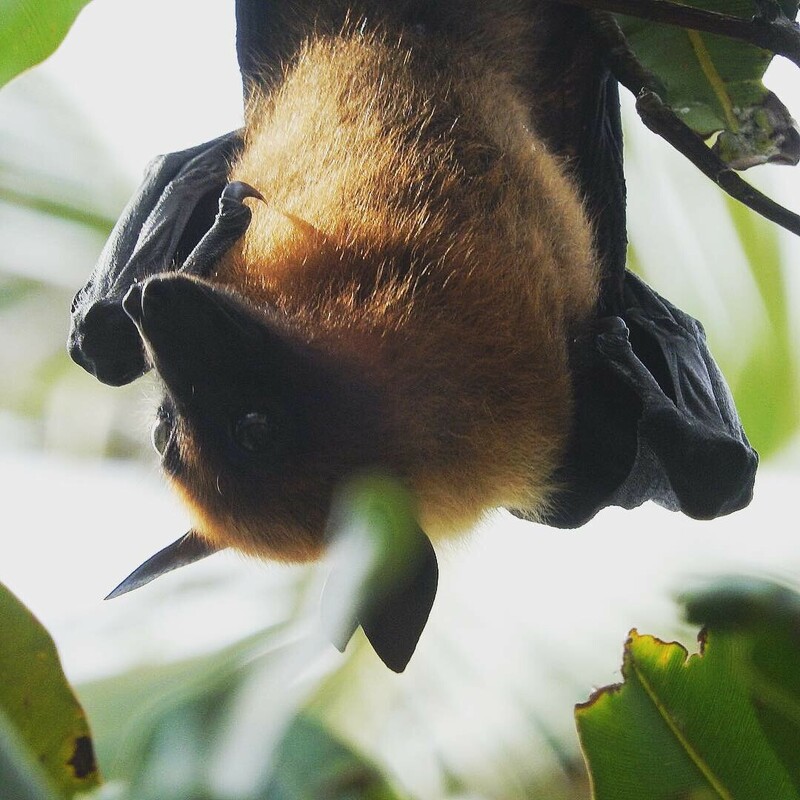 As dusk fell, the bats would swoop from tree to tree and were fascinating to watch. Some see them as pests, but they play an important role in seed dispersal and pollination (they also look very cute!). The best time to photograph them was early evening, before they start to take off. 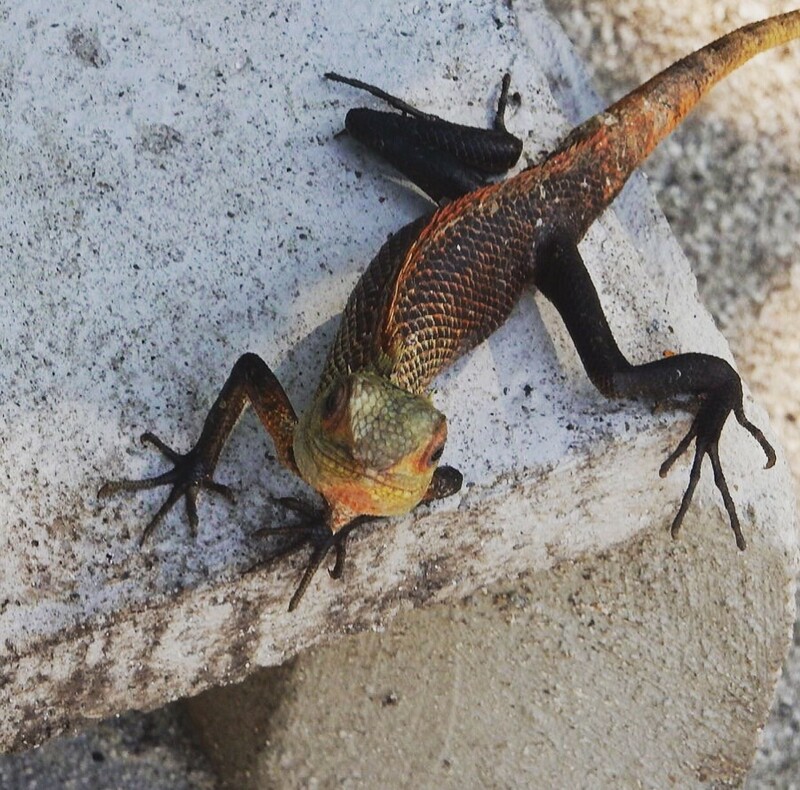 Reethi Faru had lots of lizards scurrying around the island, and they all loved posing for photos (as you can see!). 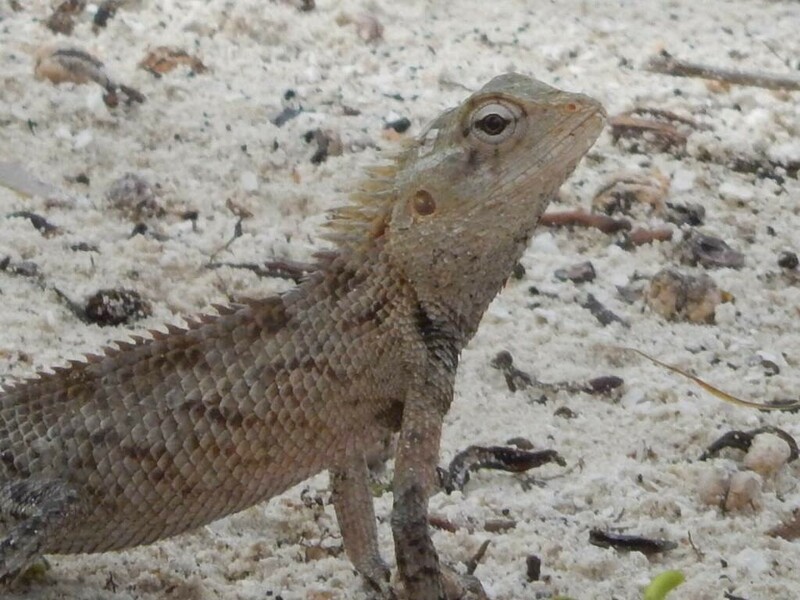 The lizards eat mainly insects and help to control insect populations...we'd often see them standing very still, before running off somewhere very quickly. 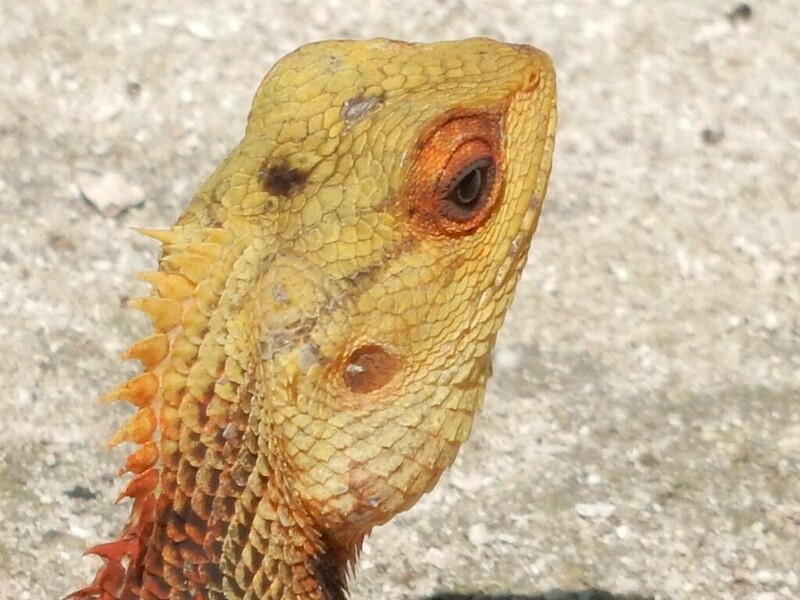 The Oriental Garden Lizard is also known as the "Changeable Lizard", due it its wide variation in colouration and ability to change colours during the breeding season. We also saw geckos in the bathroom of our beach villa; they would appear in the evening to come and say hello! 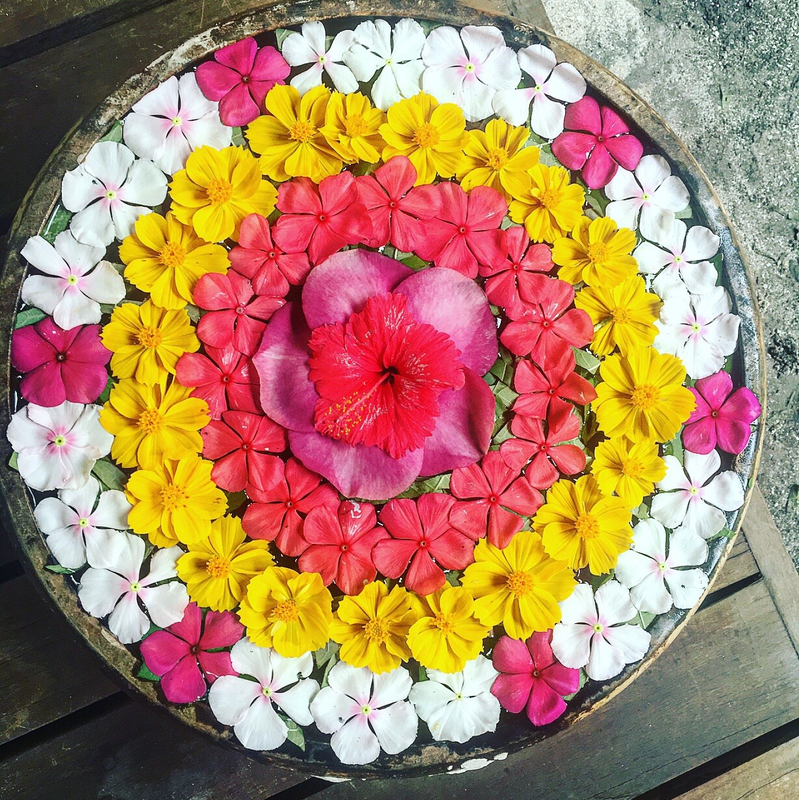 One of my favourite things about visiting the Maldives was seeing all the beautiful flowers , particularly those which you don't get back home. 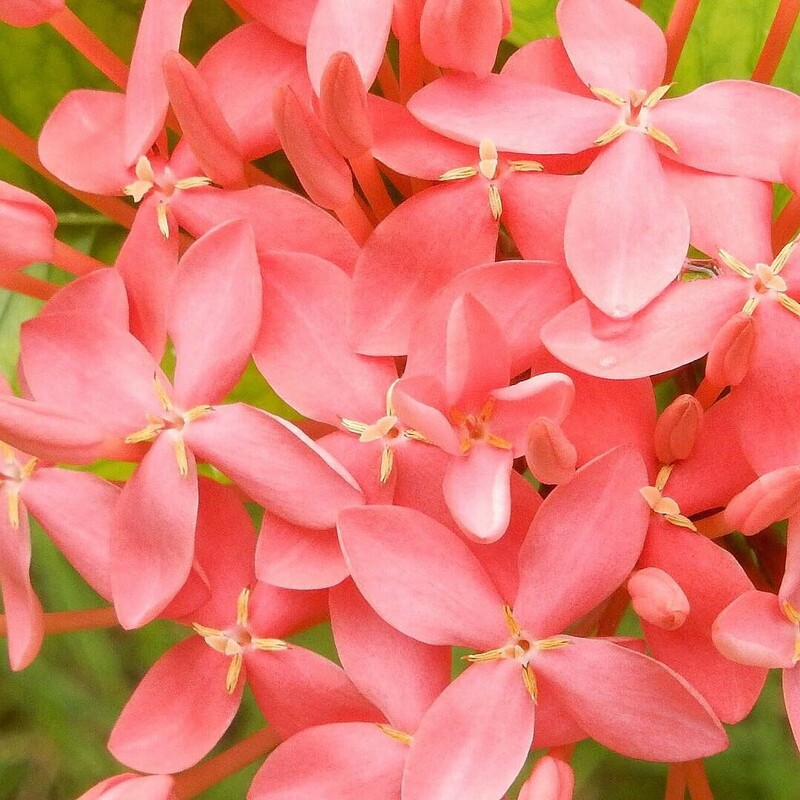 Reethi Faru had lots of different varieties of plants, trees and flowers, like frangipani, hibiscus, jungle geranium, and water lilies. 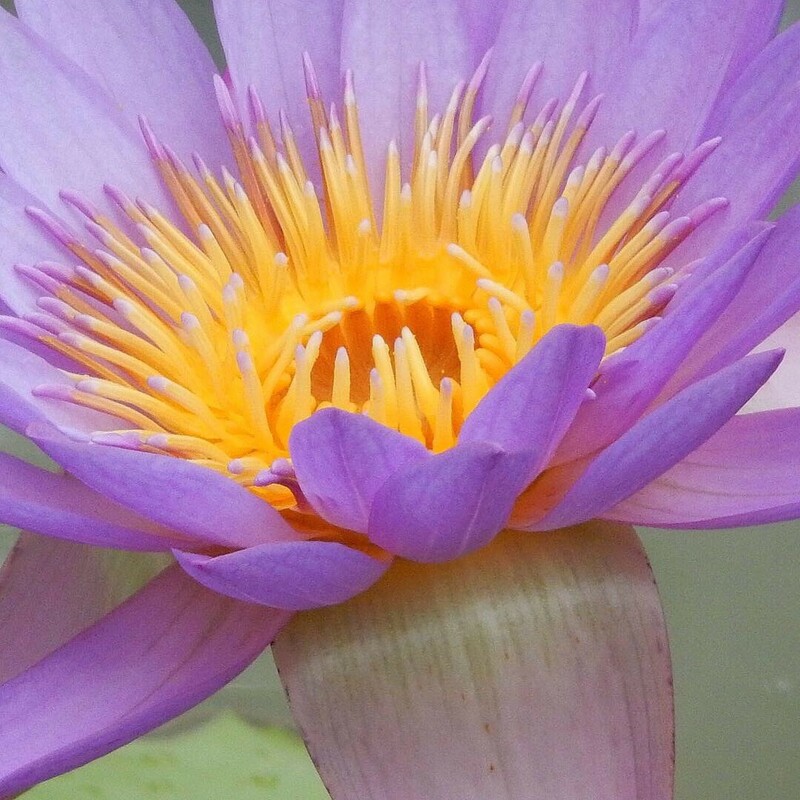 I love flowers so much and it was lovely to see them in bloom and capture some nice photos. 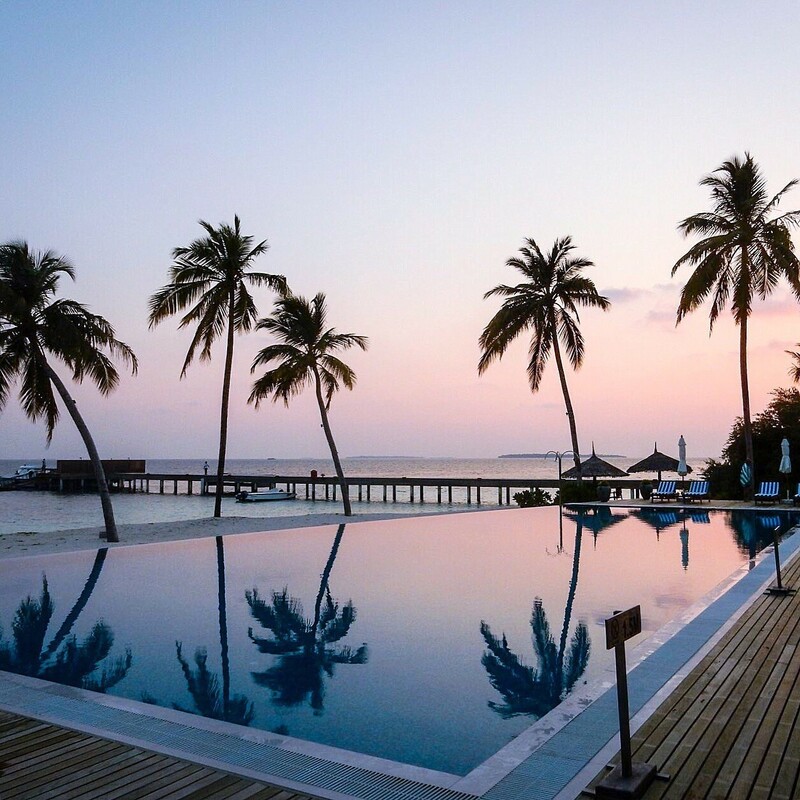 When you think of the Maldives you probably think of swaying palms against blue waters and gorgeous sunsets, and Reethi Faru didn't disappoint! There were some lovely palm trees by the swimming pool which looked really striking as the sun went down; I loved how natural and unspoilt the island was. 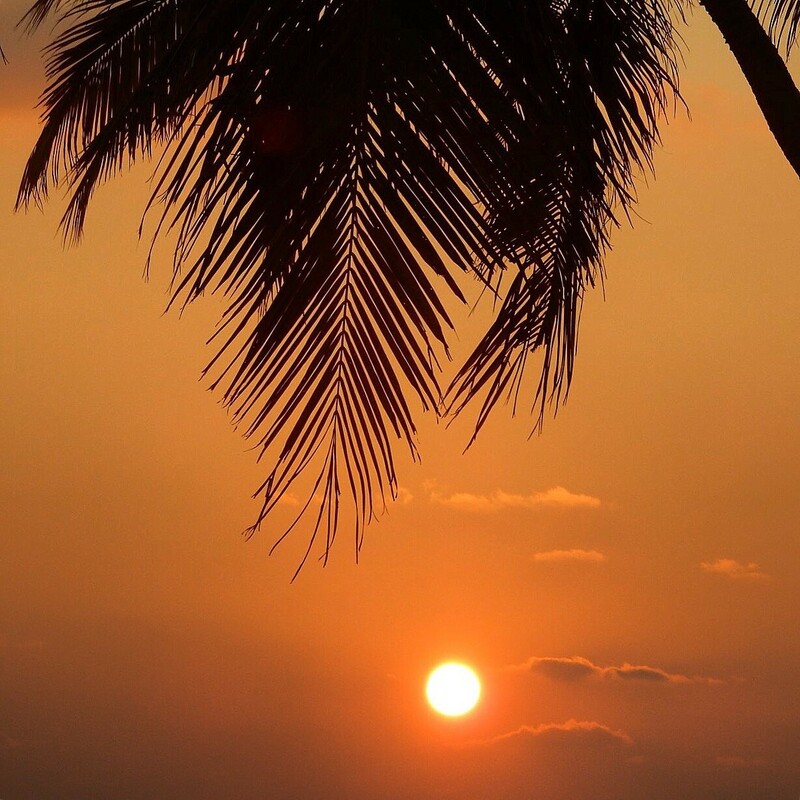 We enjoyed some really beautiful sunsets at Reethi Faru; the Sunset Bar had deckchairs on the beach so you could sit down and enjoy the sun going down with a nice drink and some popcorn. Another beautiful thing we saw on the beach at night time was a natural phenomenon called 'bioluminescence', where bioluminescent plankton glowed in the dark and lit up in neon blue patches as the tide came in. 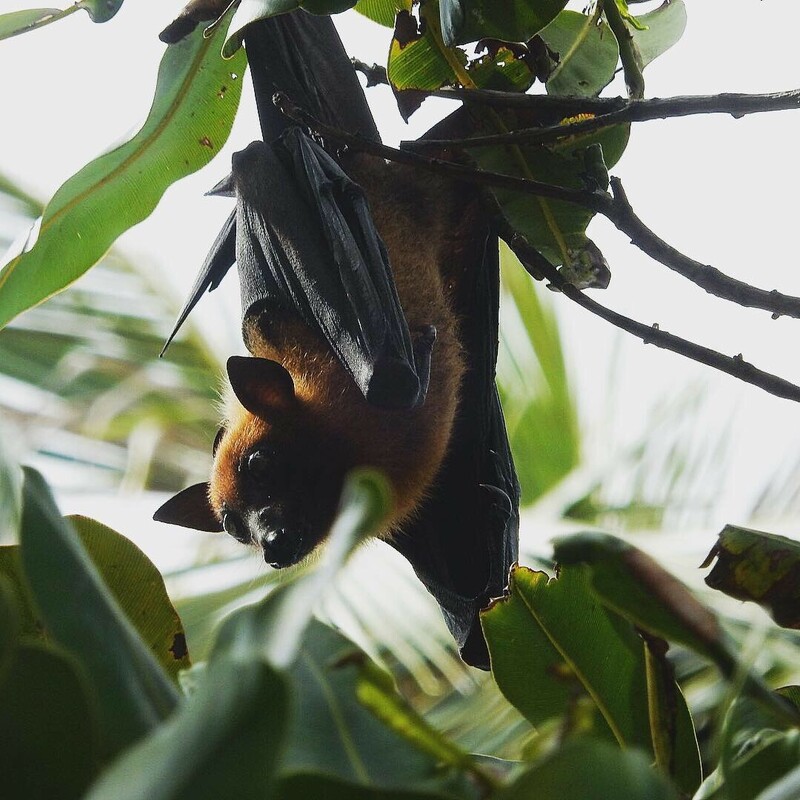 It was such a special experience to stay in the Maldives and enjoy its nature and wildlife. 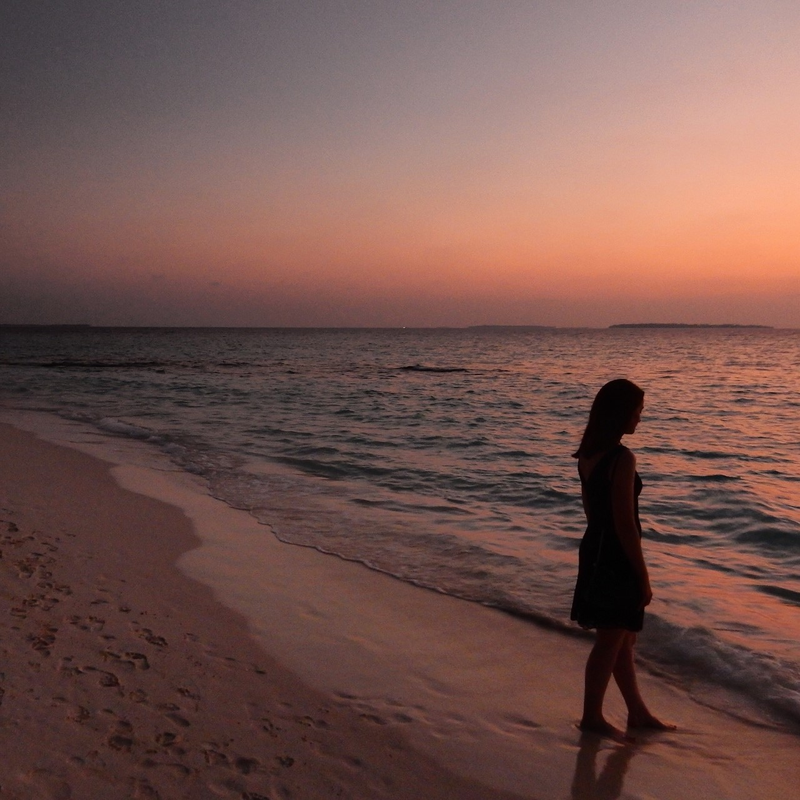 I hope you've enjoyed these photos, and I'd love to hear from you if you've also visited the Maldives! 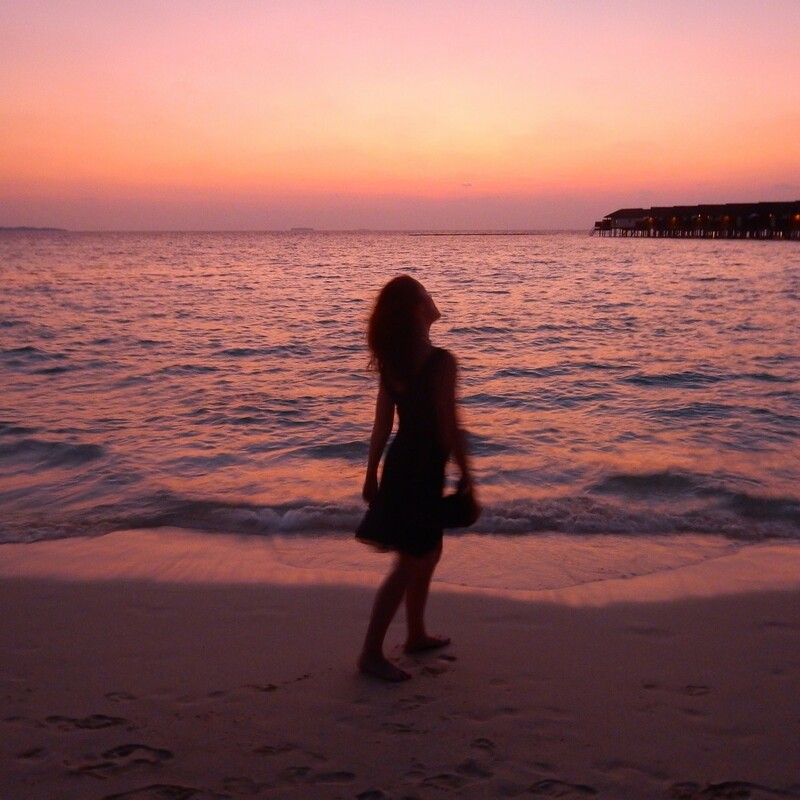 My guide to the Maldives! 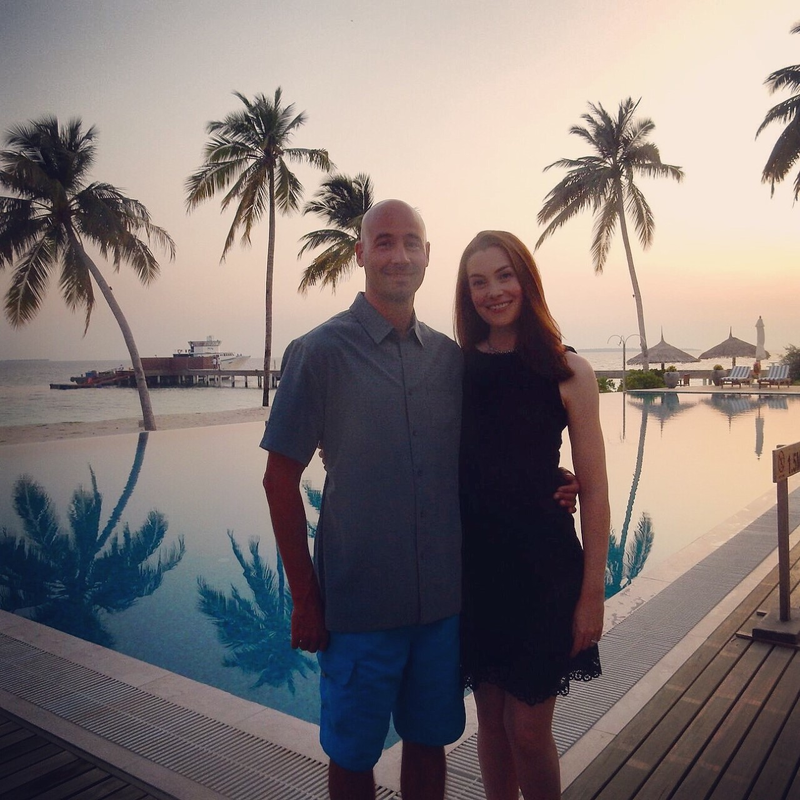 David and I went on a wonderful trip to Reethi Faru Resort in the Maldives for his birthday back in November, and I've put this post together to answer questions about our holiday and to help anyone who's thinking of planning a holiday to the Maldives. We initially felt quite overwhelmed when we were researching and planning our trip, as there are over 100 resort islands to choose from and it's hard to know where to start. It actually took us several weeks to decide on where we wanted to go, although I know some people actually spend several months doing their research, so hopefully this post will make things easier for you. We chose Reethi Faru because it opened in December 2017, so all the facilities are new but the resort had been running long enough to ensure that any teething problems had been ironed out. You get to the island via sea plane transfer, and this was definitely something that we wanted to do, so that was another box ticked. We wanted to stay somewhere fairly small and quiet, and Reethi Faru seemed to fit the bill. Some of the other islands are much bigger with more activities, but we felt that if we'd wanted that kind of holiday we would have booked to go to a large resort somewhere else like Mexico or the Caribbean. We didn't want anything too lively and we really wanted to experience the peaceful and unspoilt beauty of island life in the Maldives. We thought that the accommodation at Reethi Faru looked lovely and modern; some of the accommodation on other islands appeared to be a bit dated. Reethi Faru also has one of the largest selection of water sports in the Maldives, which was very appealing to us as we enjoy being out on the water. The resort generally has excellent reviews on Trip Advisor and has recently been crowned the leading luxury new hotel in the Indian Ocean. 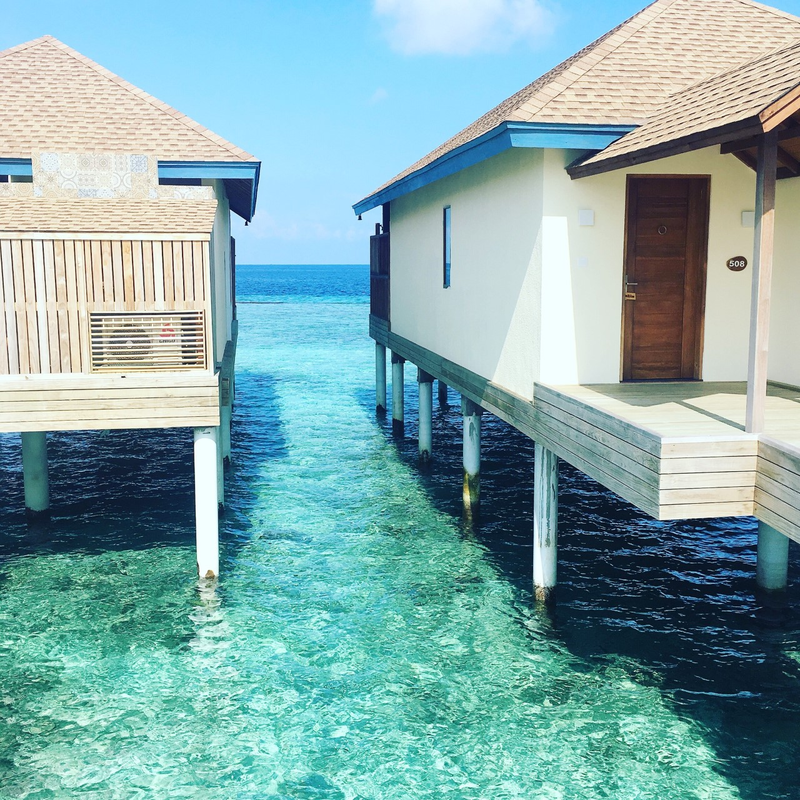 We spent our first five nights in a water villa, followed by five nights in a beach villa, so we could compare the two. What was the water villa like? Amazing! It really was like something you see in a holiday brochure. It was fully air conditioned, very spacious, spotlessly clean, and with a comfortable bed. 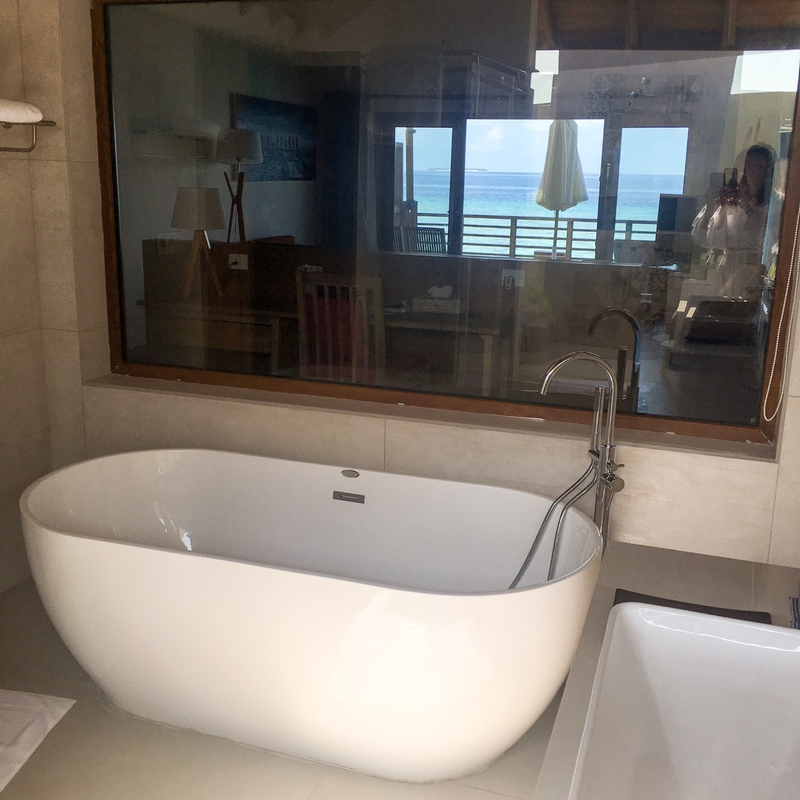 The bathroom had a huge bath tub, outdoor shower and indoor shower. The terrace doors overlooked the ocean (we requested to stay on the sunset side, which was kindly arranged for us by the resort), and this opened up to a terrace which is perfect for reading, morning coffee or a glass of wine. You could swim and snorkel right off the steps. 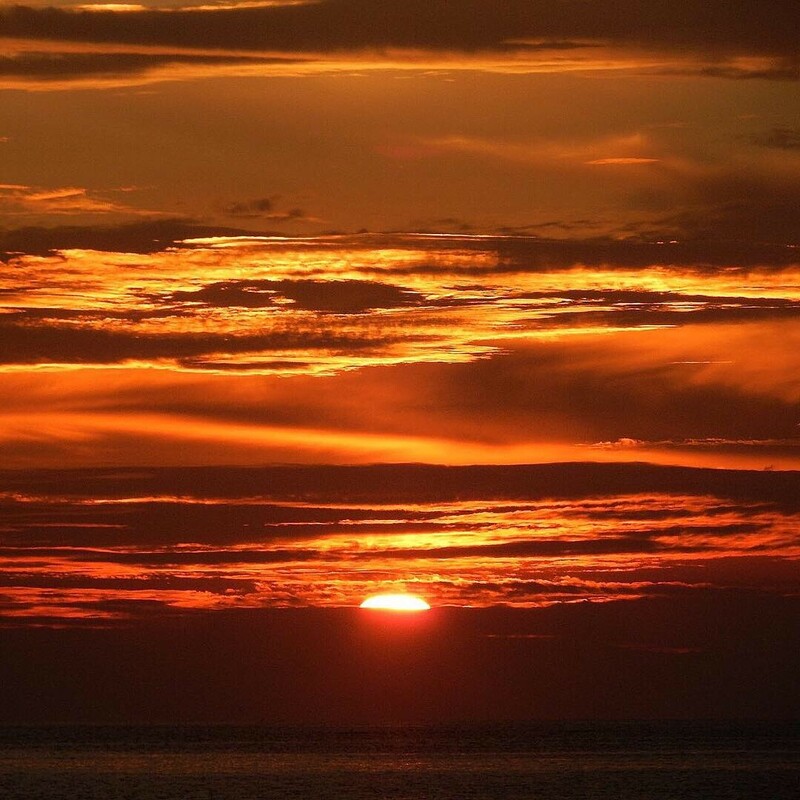 We loved the sea view and enjoyed watching the sunsets from our terrace. We could see beautiful reef fish from the wooden walkway; we even saw an Eagle Ray on one occasion. What was the deluxe beach villa like? The deluxe beach villa accommodation itself was lovely, but we couldn't see the beach from our room because it was hidden by bushes (we think that this may have been for privacy.) It was lovely being right on the beach, but overall we preferred the water villa. What website did you book your holiday on? We booked the flights with Emirates and the accommodation with Booking.com. 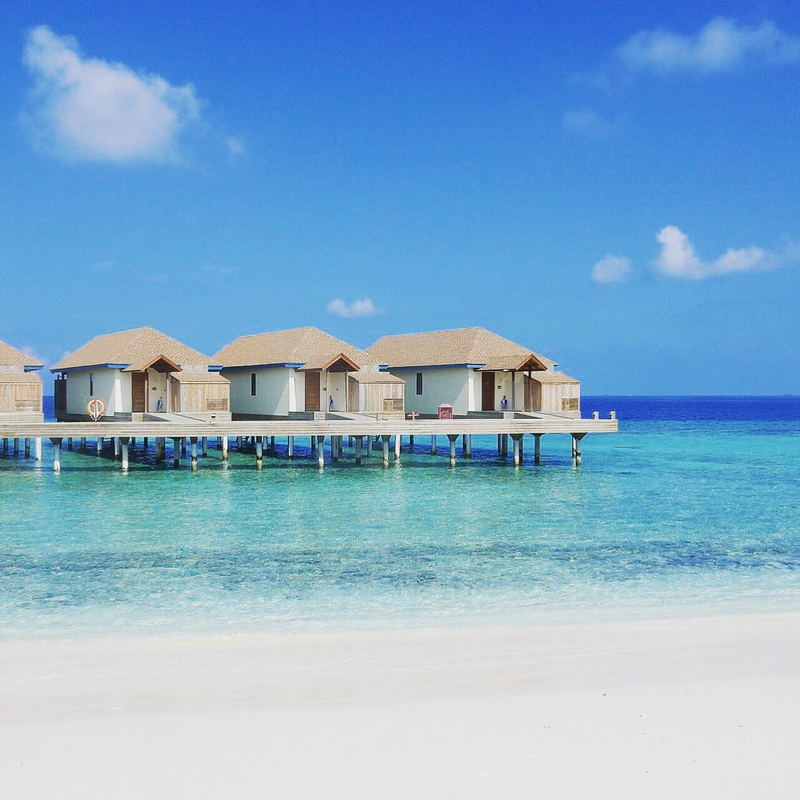 You'll need to work out your budget when you're planning a trip to the Maldives; it's possible to spend anything from a couple of hundred pounds per night to several thousand. High season is late December through to March, and prices are much higher then. If you're willing to risk the possibility of some unsettled weather (wind and rain) then there are big savings if you travel off season. Is it worth the expense when you compare it to other luxury holiday destinations? Yes and no. Yes - because there's nowhere else in the world quite like it and it really is the trip of a lifetime. No - because it's quite a mission to get there and all the travel and crossing different time zones is pretty exhausting. There are other tropical places which are easier to get to from the UK, like the Caribbean. 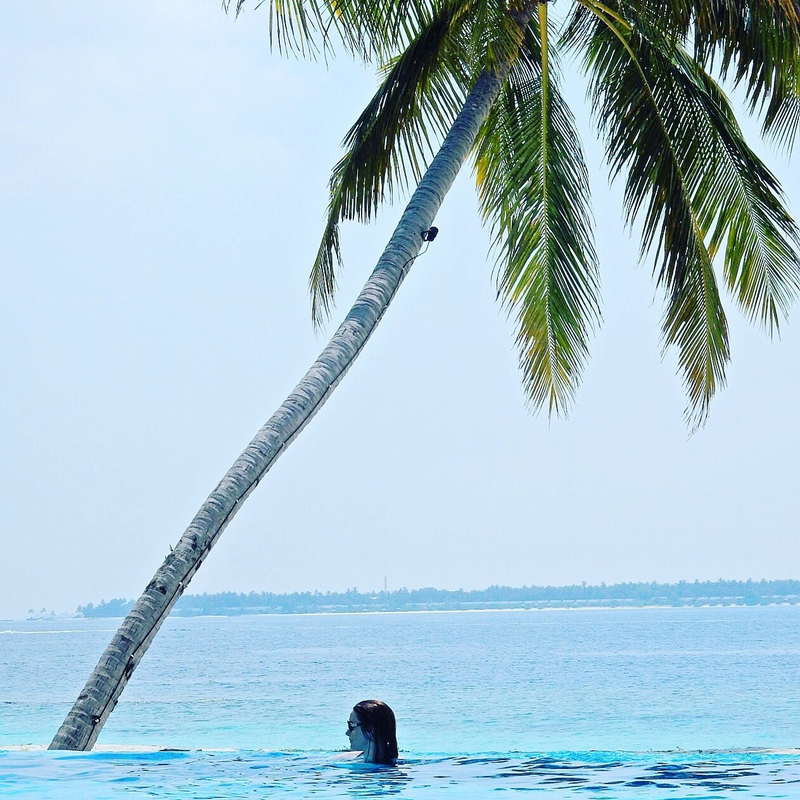 Nothing compares to the Maldives though, so you have to decide what's right for you. The snorkelling and natural beauty of the Maldives is outstanding. If you ever get the opportunity to visit the Maldives then definitely go; some people catch Maldivitis and are hooked for life! We travelled with Emirates and had a stopover in Dubai to break up our journey. The plane journeys were 7 hours from Heathrow to Dubai and 4 hours from Dubai to Malé. You then have to get a seaplane to the resort, which took about 45 minutes and costs extra. The total journey time including stopovers averages between 12-15 hours. There is only one direct flight to Malé, which goes from London Gatwick with British Airways, and this takes just over 10 hours. For the most part it was hot and sunny, but we did have a couple of rainy days with thunder and lightning at night time. Island weather can be unpredictable, even in high season. We both found the heat and humidity quite uncomfortable at times, so we enjoyed the shade by the pool with a cocktail and a good book. The sun was the most intense we'd ever experienced; I was really careful wearing SPF 30 but I still managed to burn when we went snorkelling. What was the spa like? We visited the spa for a complimentary head, neck and back massage, but we didn't indulge in other treatments because we thought they were too expensive. The spa was very relaxing and beautiful, and if money was no object then you could easily spend most of your holiday there if you wanted to! 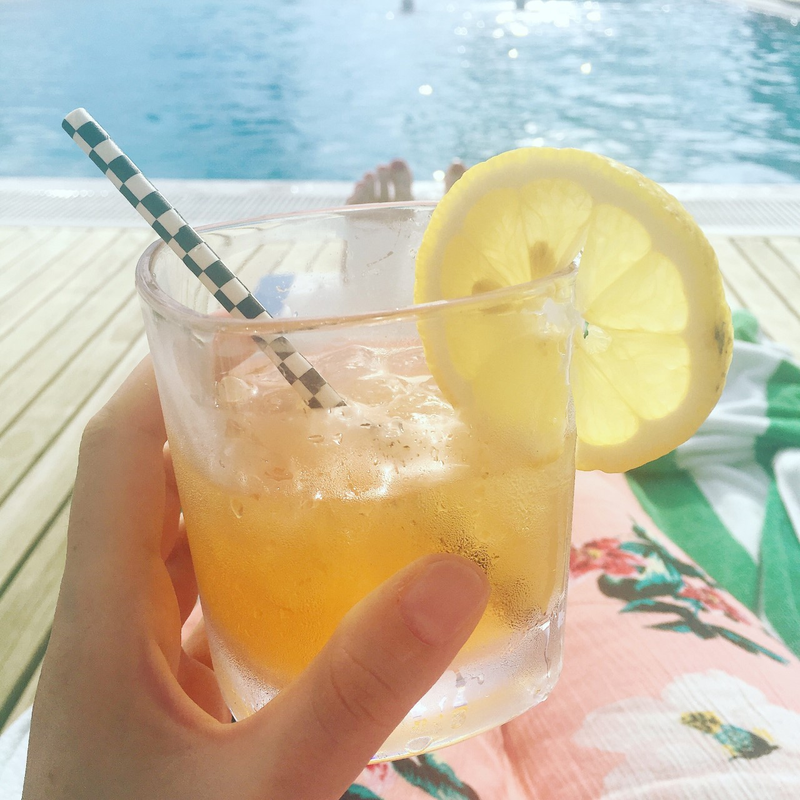 There are lots of things to do at Reethi Faru; relaxing by the pool with a cocktail, swimming, snorkelling, day trips, and diving. There's a spa, gym, and water sports, so there's plenty to keep you occupied. We LOVED the snorkelling. 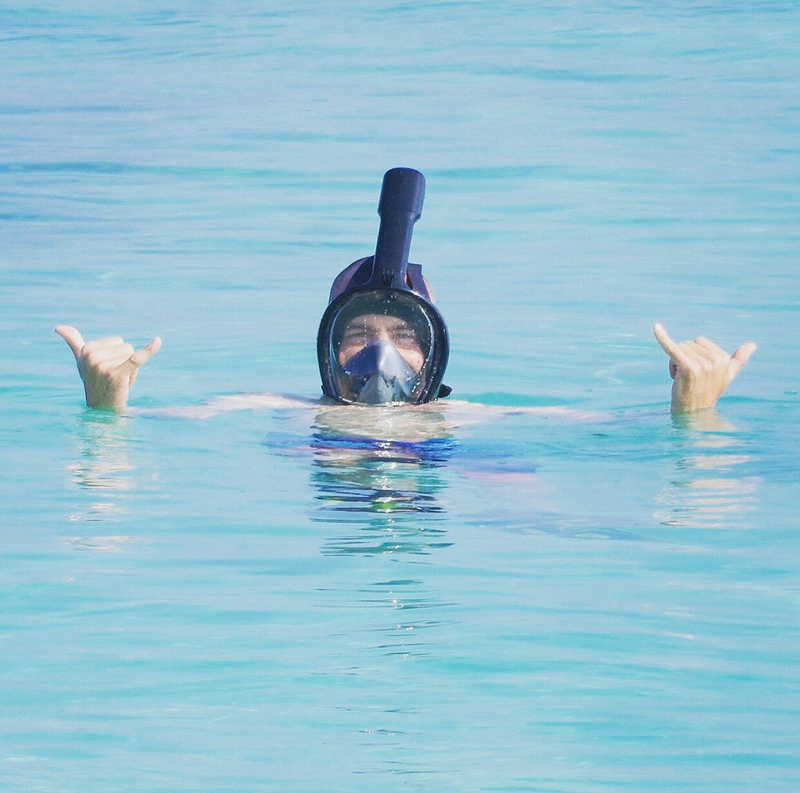 It was the best snorkelling we've ever done, and on our last day a turtle swam up to us and came to say hello! We also saw a couple of baby reef sharks and Eagle Rays, which was really cool. We enjoyed a lovely sunset cruise, and 15 min back and neck massage which was included in the all inclusive package. David completed a PADI course to become a qualified freediver (diving without the use of breathing apparatus). It's a great place to learn to scuba dive and freedive. You don't need to wear shoes either; it's a barefoot island and we didn't wear our flip flops for the whole time we were there (and I'm a girl who loves her shoes!). The plugs were UK ones so you don’t need to worry about adaptors if you're travelling from the UK. There were beach towels, a hairdryer, and toiletries in the resort accommodation. Is the island adults only? Do you get there via boat or seaplane transfer? What's included in the all inclusive option? 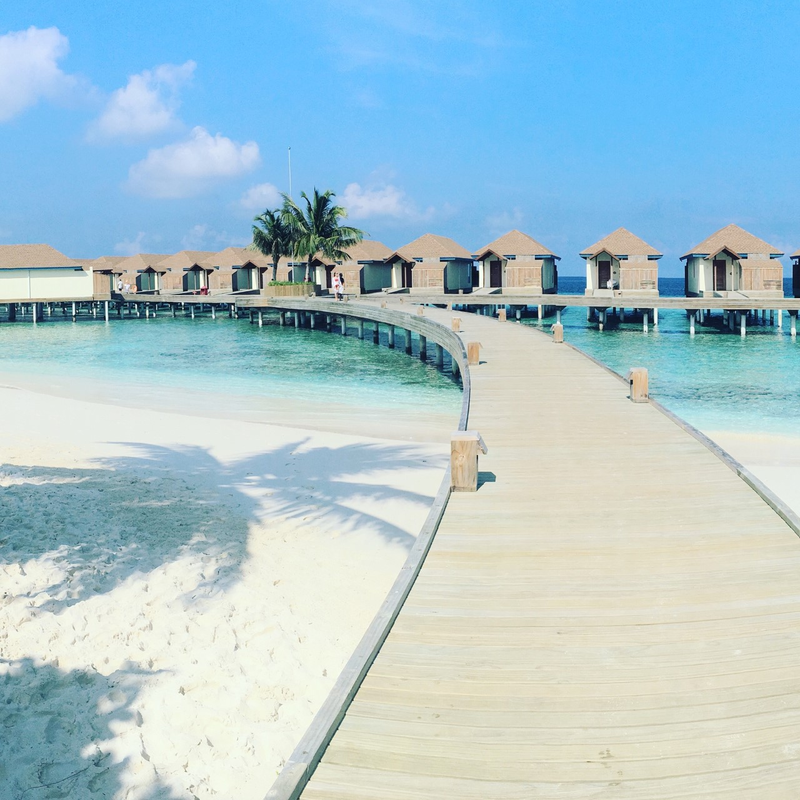 Do you want to stay in a water villa or beach villa? Do you want to stay on a large or small island? What are the reviews like on Trip Advisor? Would you recommend this as a honeymoon destination? 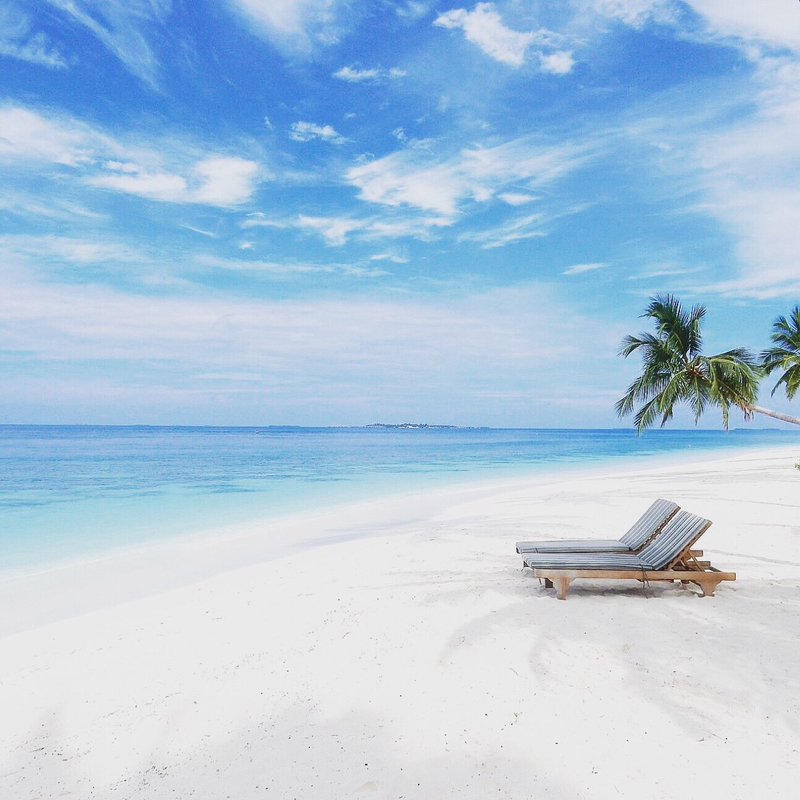 We didn't go to the Maldives for our honeymoon but I would imagine that this is a great honeymoon destination, providing you give yourself plenty of time after the wedding day itself before you travel (at least a week), as you'll feel exhausted after the wedding day. Travelling such a long distance and crossing time zones is very tiring, and spending so much money on your honeymoon really ups the stakes in terms of what you expect from the holiday. It can put a lot of pressure on both of you because you'll want everything to be as perfect as it can be, and things don't always go to plan. 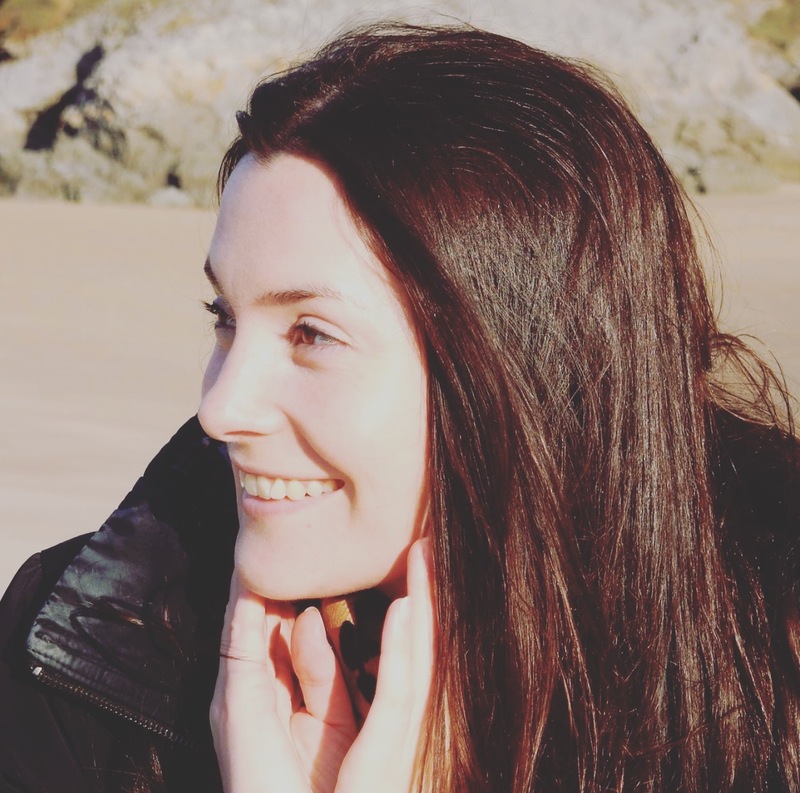 We were glad that we went on our honeymoon in Europe after our wedding day, as the travel was less tiring and less stressful from the UK, and our expectations weren't as high. We know of other couples though who went on their honeymoon to the Maldives and absolutely loved it and wouldn't have done things any differently. If you want to go then do it! 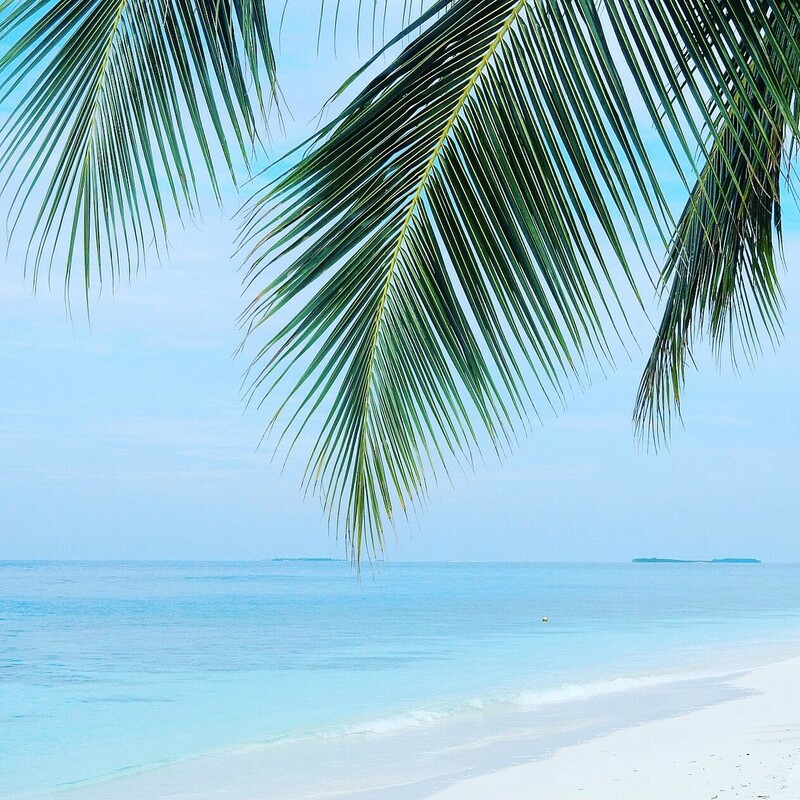 All inclusive in the Maldives is different to AI in other holiday resorts like Mexico, for example, so make sure you research what's included in the AI option before you book. All our AI meals were in the main buffet restaurant; there were a la carte restaurants too but you had to pay extra to dine at these (although the drinks are included). The good thing was that the food in the main restaurant was amazing! We'd go in there thinking that we weren't very hungry, and come away with our plates piled high and go back for seconds! The main restaurant overlooked the beach and ocean, and on one occasion we saw a pod of dolphins swim past which was really special (especially the baby dolphins!). I know that some might not like the idea of having to dine in a buffet restaurant, especially when you're paying so much, but this was completely different to any other we'd been to and we really enjoyed trying lots of different food, most of which were really healthy with lots of fresh fruit, vegetables and curries. The coconut cream & Nutella crepes weren't so healthy, but it's all about balance, right?! 😂 That said, the restaurant did get busy at breakfast and dinner, so it would have been nice to have had the option to dine at other places for no extra cost for more variety. We had a mini fridge in our room, but there weren't any extra beverages provided in the room, apart from a welcome bottle of wine and two large bottles of water which were provided daily. The resort bars had a really good selection of cocktails and spirits, and the wine which was included was ok.
Everything extra which you purchase in the resort, including food, beverages and excursions, are subject to Government tax which is around 23%, so bring plenty of US dollars for any extras and tips. Now here's the bit which may surprise you; neither of us are in a hurry to go back, for a number of reasons. It's very expensive; the prices for some of the resorts are extortionate, and even the ones that are more within budget are a bit of a stretch. There's also a lot of travel involved to get to the Maldives, and the time difference works against you when you're flying from the west. There are a number of connecting flights to get, so if any of these are delayed then this will affect the rest of your journey. Everything ran smoothly for us, apart from there being a bit of a delay with the last leg of our journey home so this wasn't a problem, but there's more potential for things to go wrong when you've got connecting flights. We found that the sun in the Maldives was too intense for us; literally from 7.00am it would be burning hot. Towards the end of the holiday I was walking around in David's hat, t shirt and boardies to protect myself from the sun, which is something I've never had to do before! We loved experiencing what it was like to go on a seaplane and stay in a water villa, but in terms of convenience, weather, and value for money we both prefer the Caribbean. Of course, everyone is different and it all comes down to your personal opinion and preference. Definitely the water villa and the snorkelling. 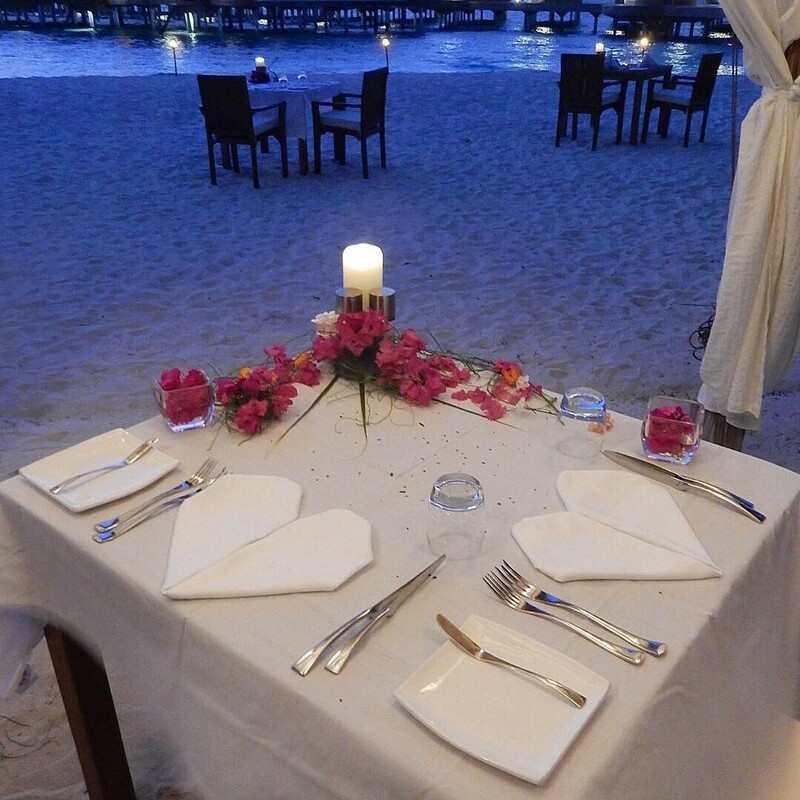 We also ate at the Reethi Grill on the beach on the last night and it was magical! I hope you've found this helpful if you're thinking of planning a trip to the Maldives. 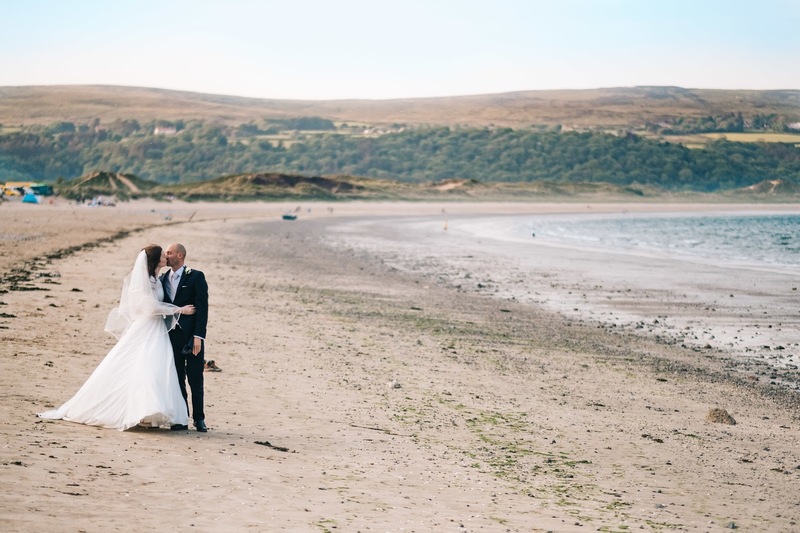 I've written this post to round off all my other wedding-related posts. 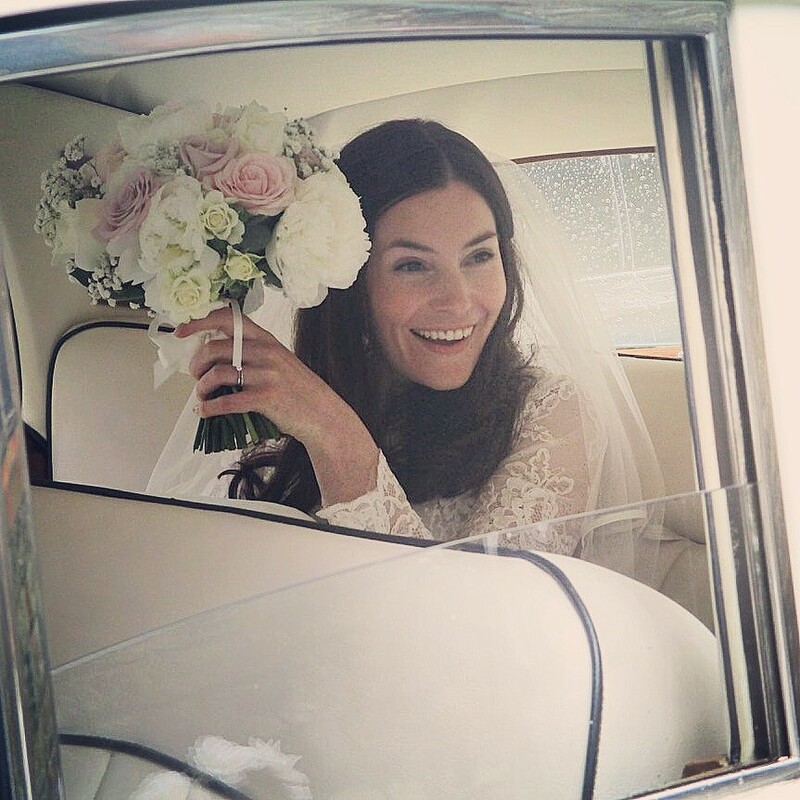 For those of you who aren't really interested in wedding planning, you can breathe a sigh of relief; normal service will soon be restored 😂 Anyway, I've really enjoyed putting these posts together and sharing our experiences with you, so thanks for sticking around! 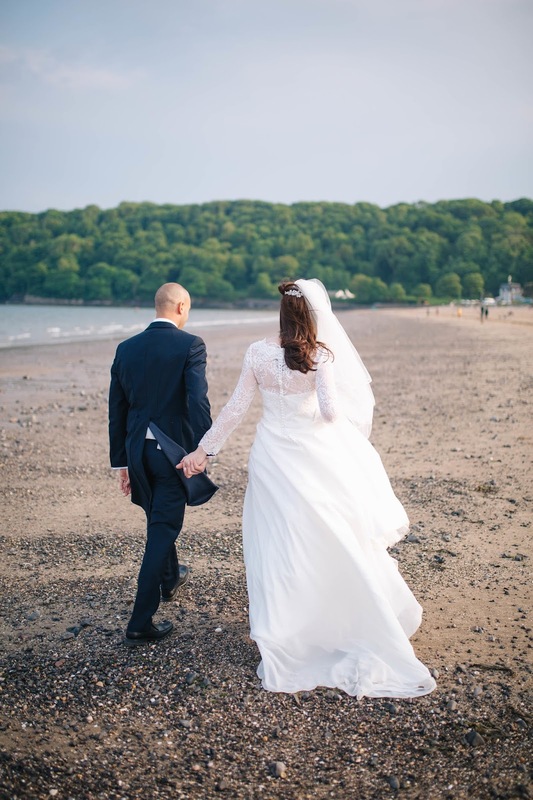 If you've got married then perhaps some of this will resonate with you; as I've mentioned previously, we absolutely loved our wedding day, but we found the lead-up to be a bit of an emotional roller coaster and quite stressful on occasion. I felt that I wanted to share some of my own personal experiences, which you may find helpful if you're planning your wedding. 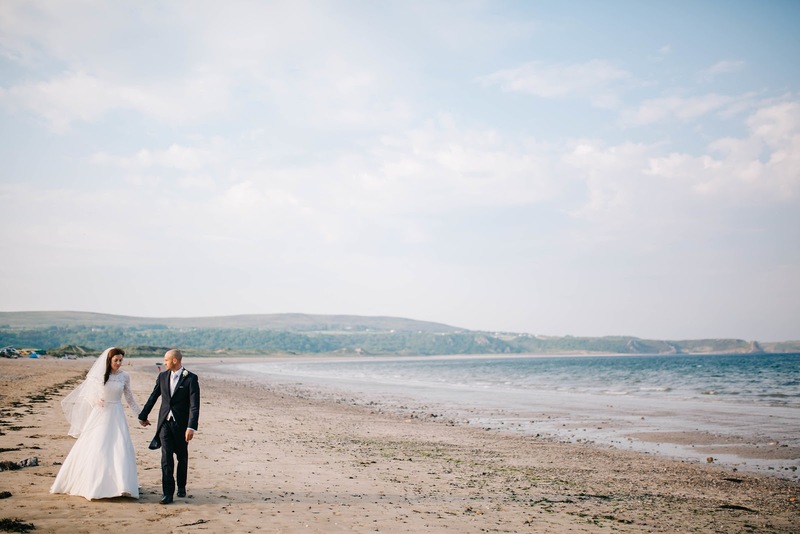 So here's my final post about some of the things we learnt from planning our wedding. Are you ready? Let's go! You'll discover that your friends and family will go above and beyond, and you'll really appreciate their kindness, and how they made you feel. Planning a wedding was hard work at times, and it was important to have stability and stay close to those who were reliable and supportive. I loved spending time with my family in the run-up to the big day, particularly as some of my family were visiting from overseas. A wedding is, after all, a celebration and a happy occasion, and it was precious to spend time with close family who assisted with the wedding preparations. My mum, in particular, was a rock throughout the build up to the wedding and on the day itself. Some people really are one in a million, and you will be so thankful for them and always remember their support and love. On the other end of the scale, you'll find that things won't always go to plan and this can be frustrating at times. For example, you may find that the wedding reception isn't available on the same day as the church, or certain things may not be within your budget. It's a challenge juggling wedding admin when you've got full time jobs and other things to do. I actually came down with the flu when we had all our wedding invites to write, which was very bad timing! You may find that people won't RSVP, or they'll say they're attending out of politeness but cancel on you later on. Don't stress...it's only a wedding 😂 I think it's fair to say that not everyone fully appreciates just how much organisation is involved (we certainly didn't until we started planning our own wedding! ), so you need to be flexible. Try to accept that these things happen and move on. A wedding is a significant life event and it can influence your personal relationships in ways you may not have anticipated. 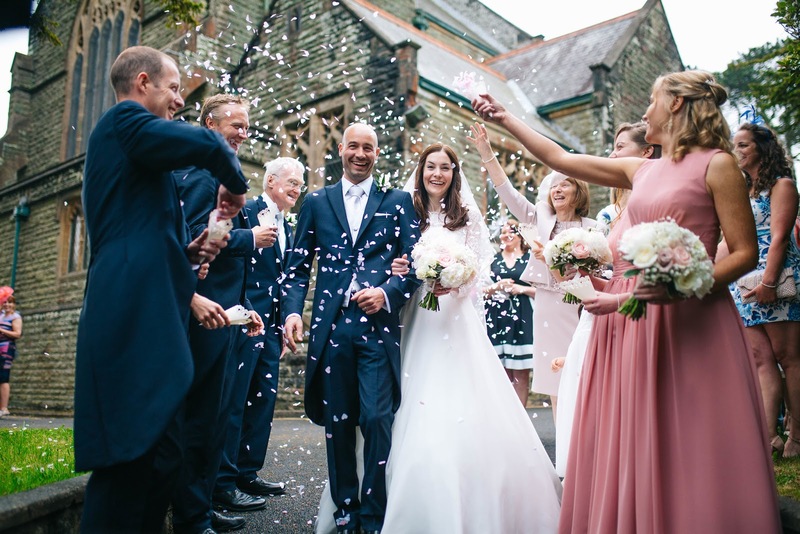 Getting married can create ripples in all your other relationships; it's a period of adjustment which can feel a bit unsettling but it's also an opportunity for new beginnings. This is the start of an exciting new chapter, so embrace the changes and you'll find that things will gradually fall into place. 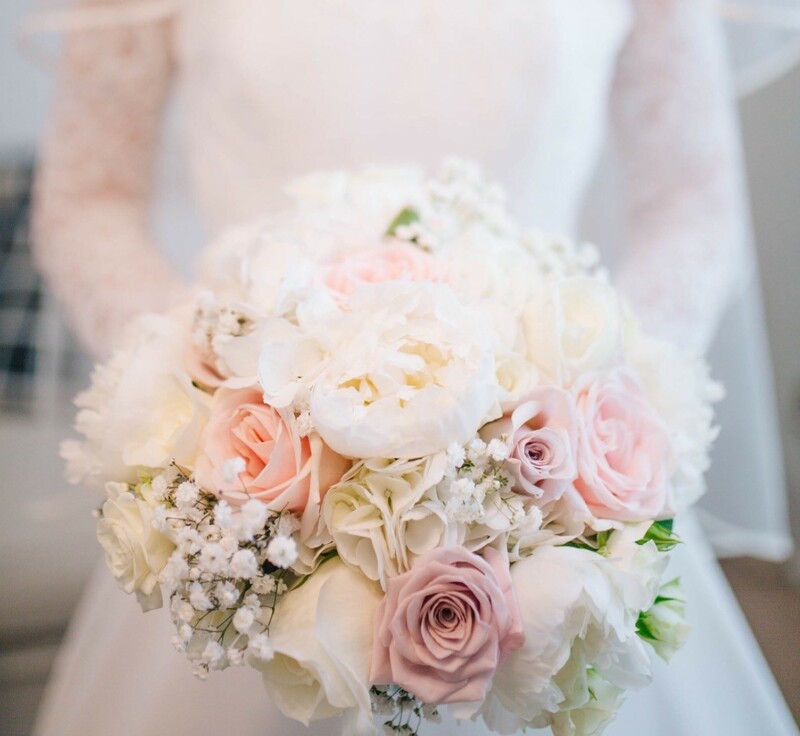 Lots of brides-to-be feel under pressure to spend a lot of money to create their perfect day, but you can have a beautiful wedding without going overboard with the costs. Weddings can be very expensive, so think carefully and discuss the things that are important for both of you and the things that you're willing to compromise on to stay within budget; it will still be a beautiful wedding. I've really enjoyed sharing my experiences with you, and I hope you've found these posts helpful. Planning our wedding was rather stressful at times, and there were several occasions when it wasn't much fun. When we first got engaged, neither of us were quite prepared for just how much work would be involved in the lead up to the wedding day. There's so much to consider, so many things to research, and lots of decisions to make; it can be exciting yet overwhelming too. I've written this post to share my experiences with you, and I hope this helps you to deal with stress if you're planning your wedding. Spreadsheets, to do lists and planners are your friend 😊 I found it really helpful to write notes on my phone when I needed to remember something; it can be quite difficult to be systematic when you're wedding planning because there will be so much going on in your head and you'll be in the middle of sorting one thing out and then you'll suddenly think of something else. David put together a great spreadsheet which kept track of things like costs, guest numbers, meal choices and contact details. This really helped, especially when we went to meetings with our wedding coordinator to go through everything. There will be unexpected changes which may be relatively minor if they were just on their own, but these "small" changes will have an impact on 101 other things so it can be a bit of a big deal at the time. You'll probably be feeling more sensitive about things too, so try to accept that there will be some last minute changes. There will be certain individuals who will shine like diamonds and will do everything they can to help things run as smoothly as possible for you. Don't be afraid to go to them and ask for help when you need it; you will always remember their kindness. You'll need this time off because it will be hard to focus in work, what will all the wedding brain fog and excitement. You'll have appointments to attend, phone calls to make, last minute changes to deal with and emails to respond to. Be proactive and check that everything's in order, let your suppliers know where they need to be and at what time, and that they have your contact details and an alternative contact. ...or at least try to! I kept waking up super early in the days before the wedding day, and the light mornings certainly assisted with this! 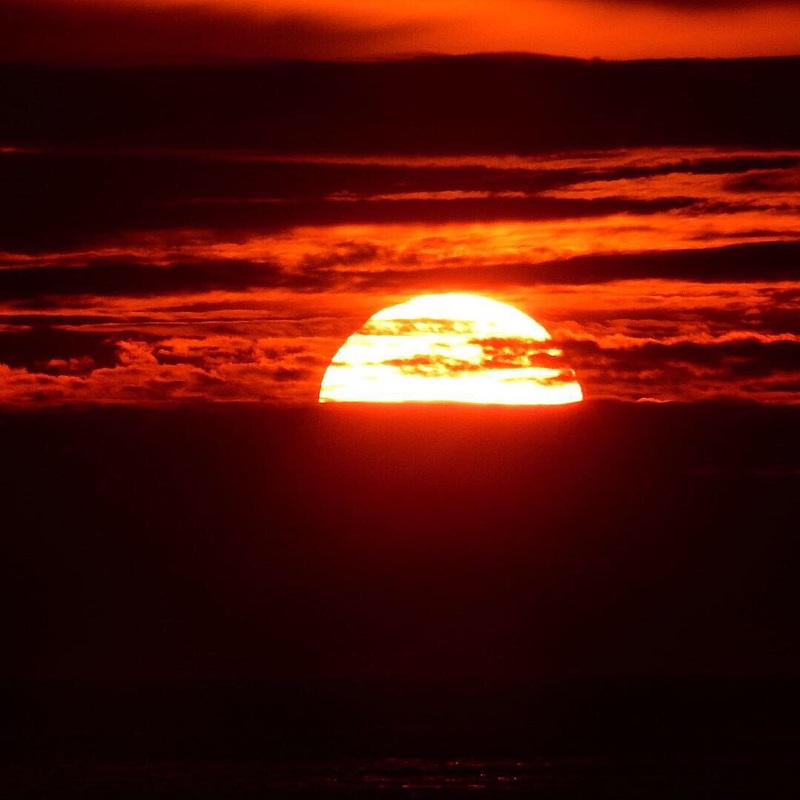 Did you know that the birds start singing at 4.30am in May? Go for a nice meal, enjoy a walk, talk things through. Your wedding day will be amazing and all the hard work and stress will be worth it, I promise! I'm definitely not a beauty and skincare expert (far from it, haha!) but I thought I'd share with you what worked for me to help me look and feel my best on my wedding day. 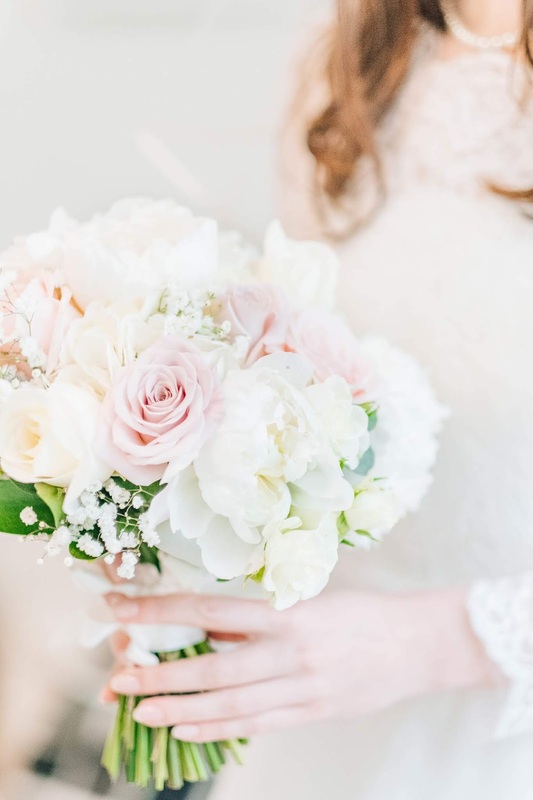 I guess I'm stepping out of my comfort zone by writing a post on this, but as a real-life bride I really hope that this helps you if you're getting married and planning your wedding day. Firstly, confidence is truly beautiful, so have faith that you're going to look gorgeous and rock your wedding! Embrace your natural beauty and please don't feel you need to hide behind a mask of makeup. I went for a minimal makeup look because I wanted to look fresh and natural; too much makeup can look ageing and fake. Another thing is that you don't need a makeup artist on your wedding day. By all means book one if you want to, but you can definitely achieve a naturally beautiful look without having one. I booked a trial with a makeup artist and it didn't work for me as I felt overdone and I spent most of the trial trying to tone it down. I've spoken to other girls who have had their makeup professionally done for a special occasion and they've had a similar experience. Less is more! Most of my makeup was from Bobbi Brown, which I purchased following a Bobbi Brown bridal makeup tutorial. I think there's something really lovely about having a fancy lipstick or mascara with beautiful packaging and branding for a special occasion. A wedding is the perfect excuse to treat yourself to something extra special that you might not normally purchase, and it's fun going round the beauty counters and trying something new. That said, you can still achieve a beautiful bridal look with less expensive makeup brands, and I used a couple of drugstore favourites too. I kept my makeup as natural and light as possible; there's nothing worse than seeing a bride caked in a mask of foundation and powder. I also made sure that I used a waterproof eye pencil and mascara; a wedding is an emotional day, so I was glad of this. In the run up to the Big Day I didn't do anything different other than use a good cleanser (Estée Lauder Perfectly Clean Cleansing Gelée/Refiner is great for oily/combination skin, and lasts for ages), clarifying lotion (Clinique Clarifying Lotion 4), moisturiser (Clean & Clear Dual Action Oil-Free Moisturiser is fab; I've used this for years!) and eye cream (Clinique Pep-start eye cream is lovely for sensitive eyes.) I have oily/combination skin, and this was what worked for me; I also made sure I removed all my makeup before bed to keep my skin as clear as possible. I didn't try anything new in the weeks before the wedding day, just in case my skin didn't like it and I had a reaction. I also didn't wear fake tan, mainly because I don't like fake tan any more, and I also didn't want to get fake tan on my beautiful dress. I wore my favourite fragrance; Chanel Coco Mademoiselle. It's a classic and beautiful scent; one that I keep going back to again and again. I mention to the sales assistant on the Chanel counter that it was for my wedding, and she gave me a card and a complimentary perfume sample to slip in my purse so I could spritz it throughout the day. I love how a scent reminds you of a special occasion, especially when it's something that you'll use for years to come. I wore my hair in a half-up, half-down style. I had a hair trial on the same day as one of my dress fittings, so I could get an idea of how I would look, and this was the style that I felt the most comfortable with. The hair stylist used heated rollers to add volume, before clipping back the front sections. In the run up to the wedding, I made sure I had my hair coloured a few days before. I had a gel manicure in a natural, pale pink colour. This lasted for almost two weeks, and meant that I didn't have to worry about my nails chipping. It got to the point where it was difficult to appreciate how beautiful the stationary was because I was paranoid that there would be a mistake. But now I'm able to look over the items and feel really happy with the end result, and it's nice to have something to look back at. 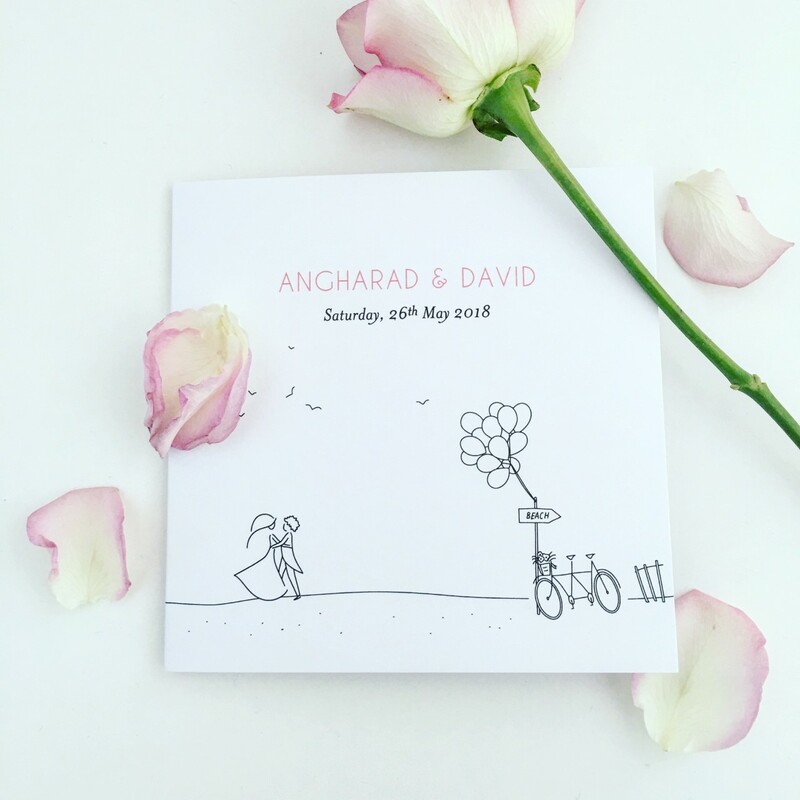 I wanted classic, timeless stationary so I chose Rosemood to print most of our wedding stationary. They were so helpful, so professional, and much cheaper than anywhere else (which was a lovely surprise!). 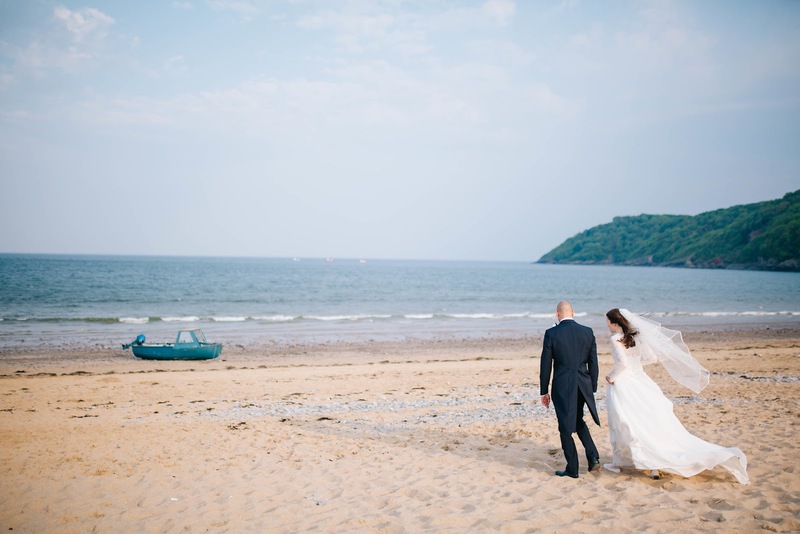 I loved that they had a particular design called Beach Promise which featured a bride and groom on the beach. As soon as I saw this, I knew it was The One! 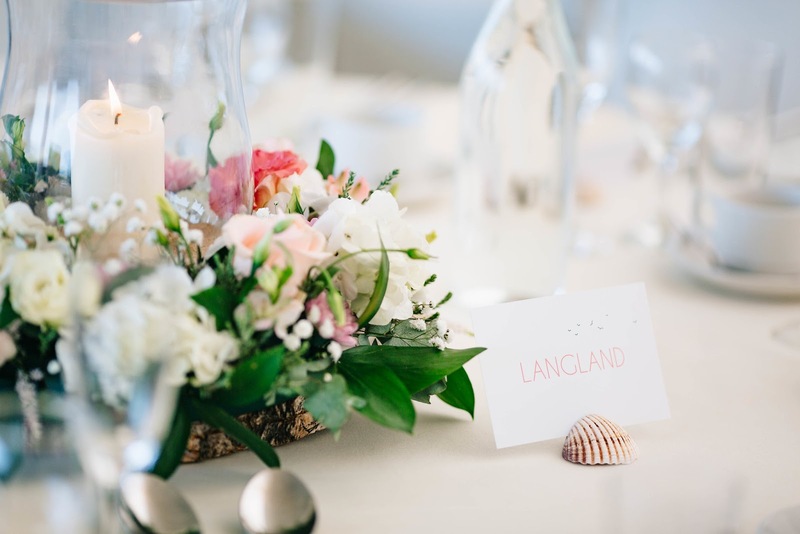 We used the same design theme for the Order of Service booklet and table names at the wedding reception. With hindsight, I should have given myself more time to sort out all the stationary. I didn't anticipate that there would be so much to consider, nor did I think that everything would take as long as it did. But it all came together in the end and we were delighted with the end result. 3. If you have your stationary printed professionally then choose a well established and reliable business with excellent customer service. Rosemood were fab! 5. Enjoy the fruits of your labour!